Thank you for "Joining the Journey!" 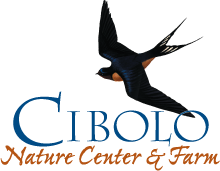 Please consider an annual or monthly gift to the Cibolo Nature Center & Farm. Recurring gifts are an affordable way for you to support the long term sustainability of the Cibolo Nature Center & Farm by giving a recurring amount each month. It is a reliable source of funding for the CNC & Farm and it's easy to enroll with a credit card using our safe and secure online form below. If you have any questions, please contact us at (830) 249-4616 or email Sara Brumby for assistance.